During the summer of 2017 I embarked on a cross country of the United States, beginning in Vancouver, BC Canada and finishing back home in New York. Along the way, I documented my trip on multiple disposable cameras, the beginning of my journey with film photography. I have always found it difficult to decide what I should do with the photos I have taken. Other than putting them on Instagram or my website, how could I utilize them? With my final for my Video Sculpture class, I decided I wanted to build a piece that could display the photos that I took in an interactive and stimulating way. The AR camera detects an image target, in this case being a logo I designed to signify an area from along the trip where photos were taking. Once recognized, the photos from that respective area are displayed in Augmented Reality around the logo. I started building the concept with the idea of using my images on a physical map, and then displaying information around the photos. After getting some advice and comments on it, I decided to change to a more streamlined version of using the locations as targets and displaying the photos from there. I built an entire route inside of Google MyMaps, from there downloading a KMZ file and converting that into a PDF, and then taking that into Illustrator. 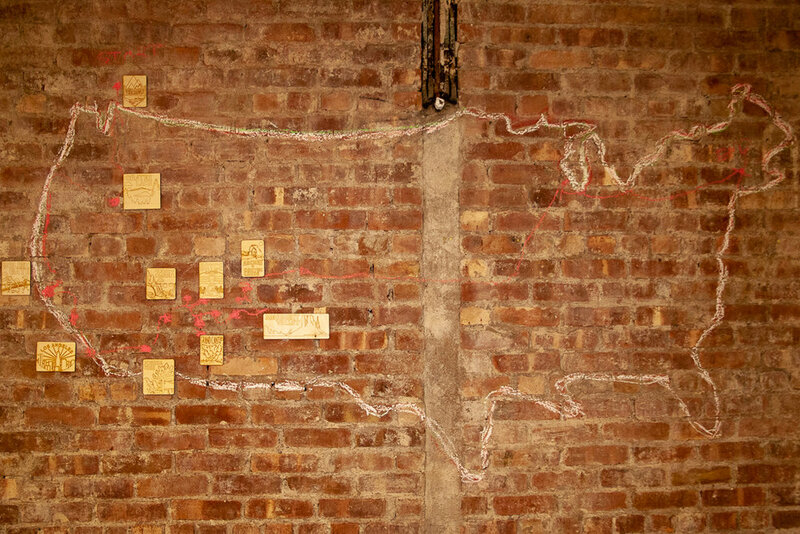 My goal was to design the entire route onto a map of the USA, and then laser cut all that on a single piece of wood. This was simplified into only cutting the logos and drawing out the outline of the state. I underestimated the amount of time the designing of the locations would take, as I was struggling to make the logos into usable AR camera activator targets for Vuforia. This cut into the amount of time I gave myself for adding more interactions into the AR aspect of the piece; like activating the photos by tapping on the targets within the app, and other information being displayed about the locations. Ideally, the entire route I drove would be displayed as the user views the installation. I view this as the first version of this piece, as I consider incorporating an actual physical map, having the AR targets being the actual locations on the map. Other interactions could include activating the targets by touch on the AR device, information on the locations, and more. This augmented reality camera identifies photos and displays content and information connected to that image. When learning about Unity as a tool to build augmented reality pieces, and using Vuforia Image Targets to display content, I thought of all the photos I have taken since I have gotten into photography. All the different places I have been, and the different cameras I used. From there I decided to build an AR camera that could identify my photos and display specific information and is associated with it. I chose a handful of my pictures that I wanted to have prints of and that worked well as image targets, with a high amount of features. Then we learned how to use a 3D-Scanner to scan objects, and I decided to scan my camera, which I found to be amazingly difficult. The camera was so small with so many intricate gaps in space that made it not the easiest object to scan. I wanted to add more interaction within the AR app, like a running browser that could pull data off of the internet, other photos from that location, and more features, but time and experience with Unity only allotted so much. I was really happy with this project. More of a conceptual piece, I want to be able to take this concept and use it in multiple settings. I picture it being used in museums next to pieces of art or objects in place of museum labels.